Above: Photograph of Battion Shelter. These are life-sized anthropomorphs. Notice the hairstyles on the three figures to the left. The surface of the panel has flaked away and much paint has been lost. This is only a small portion of a long painted wall containing hundreds of figures. Unfortunately, much of the surface has eroded. This fact, combined with layers of superimposed paint makes it difficult to distinguish the individual characters. 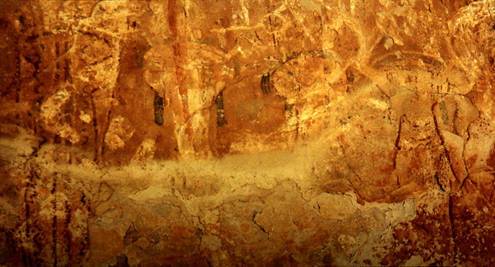 Above: Field sketch of anthropomorphs in the photograph above. 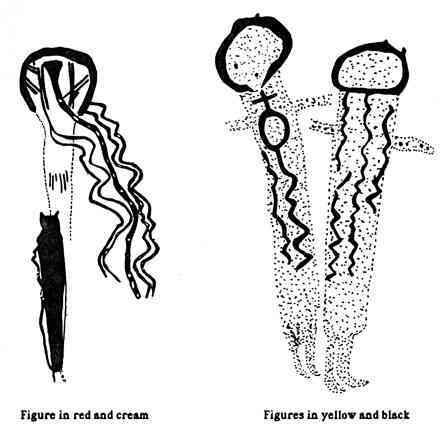 The hair on these figures is depicted in a style found on Basketmaker mummies: hair cropped short near the face, with longer hair wrapped in bundles below the ears. 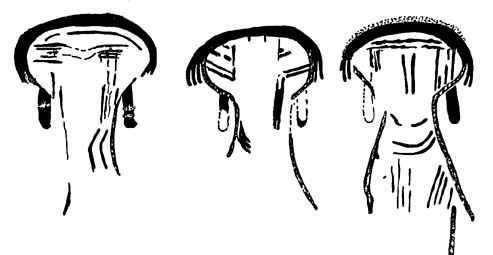 Perhaps the linear decorations on the faces indicates tattoos or ceremonial face paint. About Battion Shelter...I've chosen to depict this site with a series of field sketches rather than photographs for two reasons. First, it is an extremely complex site, with hundereds of elements and lots of superimposed figures (I believe in it's pristine condition it would have rivaled Shaman's Gallery in beauty and interest). Second, it has deteriorated badly and many portions of the panel surface have flaked away. Thus the photos of the site, while intriguing, are dificult to decipher. 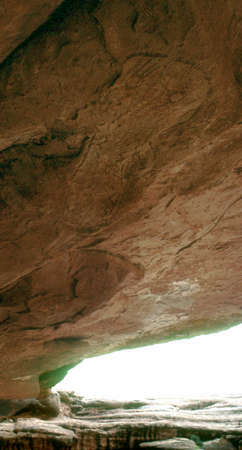 A possible connection between Archaic artifacts found in caves throughout the Grand Canyon and the Grand Canyon Polychome rock art is found at Battion Shelter. Here is a sketch of a small red pictograph from Battion Shelter that resembles a split-twig figurine. A ghost-like anthropomorph painted on the underside of a shelf in the overhang. It's not visible unless you crouch down on your knees and look up under the ledge.